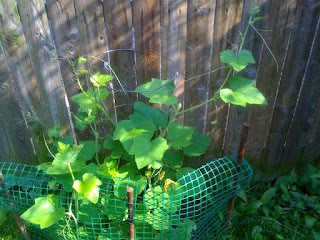 Pumpkin Patch Update: More flowers! 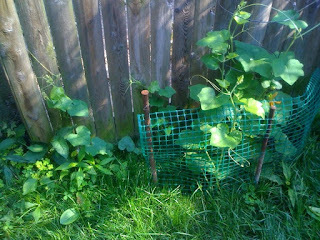 My pumpkin patch is flowering. What was once a very small plant from Lowe's has taken over its small portion of the yard. It seems to be shooting out more each day, and I was very happy to see the orange flowering beginning this week. My patch seems to be getting all the sun it needs (I hope, this is my first time growing them.) I haven't ventured out to Lowe's or Home Depot again yet for the fertilizers everyone recommends-- perhaps that's something for this weekend. Here's a fact sheet for growing giant pumpkins in the home garden from The Ohio State University. And everything you ever wanted to know from The Pumpkin Nook. And, yes, I plan on sitting out there on Halloween night waiting for the Great Pumpkin. Also, I just realized that my last post actually features a picture of a ghost upon the floor.